Faux Fur Hoodies'. Its hugs all round with our fabulous faux fur hoodies! 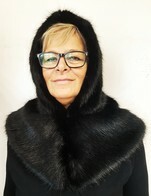 Perfect to keep snug and warm, a hood and scarf in one great value, our design is unique to the throw company and a stunning and practical fashion accessory. Lined in the softest Velboa this years must have. The 'scarf ' part of the Hoodie can be worn in several ways (as in the pictures below) making it a very versatile fashion accessory. Faux Fur Hoodie with Pockets. Wrap yourself in luscious warmth with our adorable Faux Fur Hood with Pockets, a fabulous faux fur hood and pockets combined Perfect to keep snug and warm, a hood, scarf and mitten in one great value, our design is unique to the throw company and a stunning and practical fashion accessory.